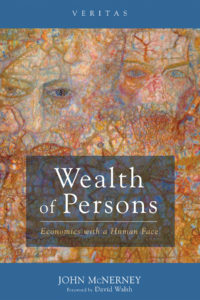 Available in the Veritas  series: Wealth of Persons: Economics with a Human Face, by John McNerney, with a foreword by David Walsh. Thomas Piketty’s Capital in the Twenty-First Century initiated a great debate not just about inequality but also regarding the failures found in the economic models used by theoreticians and practitioners alike. Wealth of Persons offers a totally different perspective that challenges the very terms of the debate. The Great Recession reveals a great existential rift at the core of certain economic reflections, thereby showing the real crisis of the crisis of economics. In the human sciences we have created a kind of “Tower of Babel” where we cannot understand each other any longer. The “breakdowns” occur equally on the personal, social, political, and economic levels. There is a need for an “about-face” in method to restore harmony among dissociated disciplines. Wealth of Persons offers a key to such a restoration, applying insights and analysis taken from different economic scholars, schools of thought, philosophical traditions, various disciplines, and charismatic entrepreneurs. Wealth of Persons aims at recapturing an adequate understanding of the acting human person in the economic drama, one that measures up to the reality. The investigation is a passport allowing entry into the land of economic knowledge, properly unfolding the anthropological meaning of the free economy. Copyright © 2009 Centre of Theology and Philosophy. All rights reserved.